Olympian and Emirates Team New Zealand helmsman Peter Burling has capped off a successful year of awards and sporting achievements at the 2017 Bay of Plenty Sports Awards, taking home the Bayleys Real Estate Sportsman of the Year award and the Sport Bay of Plenty Supreme Award. Peter now enters the award’s history books as a four-time Supreme Award winner, receiving the award in 2006, 2013 and 2016 – the most of any athlete since the awards were first held in 1969. He is also the first-ever athlete to receive the award in consecutive years. Hosted by Sport Bay of Plenty, the 2017 Bay of Plenty Sports Awards were held at the Rotorua Energy Events Centre on Friday, November 24 to recognise and celebrate outstanding achievements by Bay of Plenty athletes, coaches and officials over the past 12 months. Peter was up against some tough competition in the Sportsman of the Year category, with athletes Black Cap Kane Williamson, canoe slalom’s Mike Dawson, sidecar passenger Robbie Shorter, athletics champion Joseph Millar and motorsport’s Richie Stanaway all finalists. 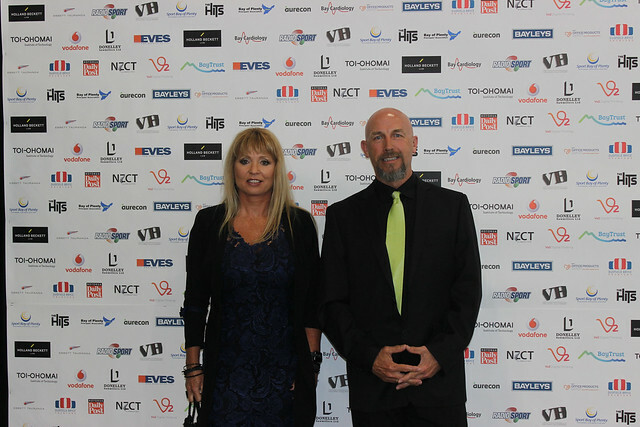 However, Sport Bay of Plenty Sport Manager Megan Cleverley says after the Tauranga Boys’ College alumni secured an against-all-odds win at the Louis Vuitton America’s Cup, it was a unanimous decision from the judges to name Peter both Sportsman of the Year and 2017 Supreme Award winner. Although Peter was unable to attend the awards in person, as he is currently sailing around the world in the Volvo Ocean Race, a recorded message of thanks was played to the crowd and his mother Heather was in attendance to receive the trophies on his behalf. Olympian Lisa Carrington was named this year’s Holland Beckett Law Sportswoman of the Year, which she has won an amazing five times prior (2011-2013; 2015-2016). She also won the Secondary School Sportswoman of the Year award when attending Whakatane High School in 2007. The hockey community had a good year, with the University of Waikato Midlands U21 Women’s Hockey Team taking home the NZ Community Trust Junior Team of the Year award, and Bayleys Midlands NHL Women’s Hockey Team winning the Rotorua Daily Post Team of the Year. Hockey official Kelly Hudson was named Radio Sport Official of the Year, which she also won in 2016, and Patti Sutton received the Bay of Plenty Principals’ Association Secondary School Service to Sport for her contribution to the sector. In the junior division, triathlete Hayden Wilde was named Vodafone Junior Sportsman of the Year for a stellar year of achievements, including placing third in the 2017 Port of Tauranga Half Ironman alongside long-time Ironmen Cameron Brown and Braden Currie. Downhill mountain biker and current world number two Shania Rawson took home the Eves Realty Junior Sportswoman of the Year trophy – an honour previously won by Olympians Luuka Jones and Molly Meech. But it wasn’t all about the athletes, with numerous volunteers, coaches and officials in the open and secondary school space rewarded for their dedication and commitment. The Open Service to Sport Award was given to those who have been involved in their chosen sport for at least 10 years and have made a significant contribution at either regional or national level. This year 10 local volunteers were rewarded for their contribution to the sporting space across a number of codes. This included Fiona Keegan, who is a club life member of the Tauranga Indoor Bowls Association, local umpire Paul van de Salm who has contributed 11 years to WaiBOP and Papamoa Football, and Bay of Plenty Badminton Association Vice President Lee-Ann Fraser. Sport Bay of Plenty CEO Heidi Lichtwark offers her congratulations to all this year’s finalists and winners, and looks forward to being a part of the prestigious event’s 50th anniversary in 2018. “What I love most about these awards is it’s honouring the region’s top achieving alongside those at a community level who often don’t get their moment to shine and saying a big, ‘Thank you’. Click here for a full list of the 2017 winners.